Who is Congressman Tim Ryan, and why is he pushing New Age/Buddhist “mindfulness” in public schools? Among the fifty states, Ohio could hardly be considered the most liberal, or the most anti-Christian, or the most New Age state. 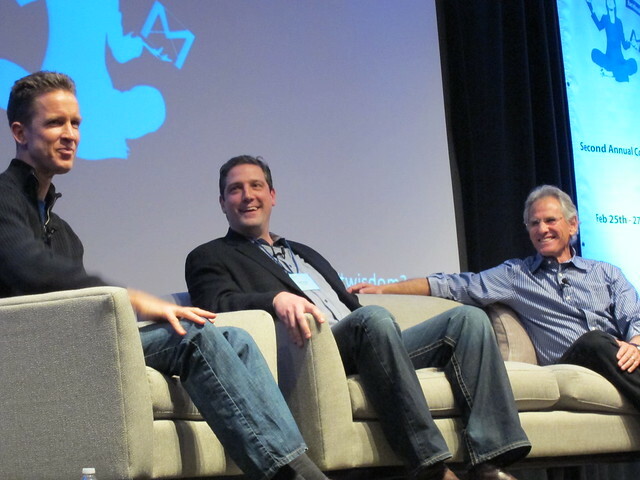 Yet, for whatever reason, a young Congressional Representative from Ohio – Tim Ryan – has become a darling of New Agers. Why? Because he has become a strong advocate of New Age/Buddhist “mindfulness” (also called “mindfulness meditation”). I am especially concerned that he is pushing this practice for public schools – including preschools and grade schools. A number of New Agers are endorsing Ryan’s new book A Mindful Nation. Ryan is also pushing legislation that will increase the practice of mindfulness in public schools. Other New Agers championing mindfulness in public schools are Jon Kabat-Zinn and Goldie Hawn. CAPTION: Rep. Tim Ryan, D-OH, practices meditation with kids at Robert Coleman Elementary School in Baltimore. So when and how did Ryan get involved in mindfulness (also called “mindfulness meditation”)? Check out excerpts from this interview (I have emphasized certain points by bolding in orange, and inserted comments [in brackets in bolded orange]. A: The book came out of my going around the county to meet scientists studying mindfulness; teachers using it in schools; health care practitioners implementing it in our health care system; our military using it to treat veterans and build mental resilience. And I thought the world needed to see what they are doing. They are pioneers in what will be the next great movement in the United States: the movement of mindfulness. Q: When did your interest in mindfulness start? A: It started a long time ago. My grandparents and my mom prayed the rosary a lot, and later in life I had a priest friend of mine teach me centering prayer, based on Father Thomas Keating’s work. That led to practicing different kinds of meditation off and on as I got older. Q: And when did you begin to consistently practice meditation? A: I had been running extremely hard with my job and traveling across Ohio and the country to help Democrats take back the House in 2006, and then there was the presidential election. I was 35 and I thought, “I’m going to be burned out by the time I’m 40. I really need to jump-start my meditation practice.” Two days after the presidential election, I spent five days at a retreat [led by mindfulness “guru” Jon Kabat-Zinn] in increasing levels of silence. It reminded me of how I felt when I played sports: being in “the zone” with mind and body grounded in the present moment. Q: And you continue to meditate every day? Q: Because of mindfulness’ Buddhist roots, a lot of people think it’s a religious practice. How does your meditation relate to your Catholic faith? A: If you love your neighbor and are compassionate, are you automatically a Christian? Practicing present-moment awareness does not entail joining any religion or accepting any belief system. [Yes it does – the core of mindfulness is a New Age/Buddhist worldview.] As a Catholic, I find mindfulness helps me participate in my religion more wholeheartedly. If you are praying the rosary, participating in the rituals at Mass or listening to the priest preach, you will actually be paying attention! Whatever your religion is, it can enhance the experience of participating in that religion. What’s more beautiful than that? Q: There do seem to be some Buddhist concepts in your book, such as the interconnectedness of all beings. Has meditation made you more interested in Buddhist philosophy? A: I love studying different religions. For me, learning and drawing from the different religious traditions is essential to being a good public servant. And the connections between our various religious traditions become our public ethic; they tie us together. How have you helped introduce mindfulness in the education system? About three years ago  I got a million dollars to put social and emotional learning and mindfulness in two school districts in Ohio, and the teachers have responded in a wonderful way. In the Warren City School District they just added another fifty teachers—the teachers who were in the program spoke so highly about it that other teachers wanted to do it too. The programs we’re running also have a parental component. Parents are learning how teachers are talking to the kids about being aware of their emotions. This makes a connection with the families. Mindfulness is not a silver bullet. But there’s nothing else right now cutting against the huge influx of information and technology coming at our kids. We want to give kids the ability to choose what they put their attention on. I’ve seen it in my own district— parents and teachers love it. Note – all of the above articles are copyright Dave Mosher, all rights reserved. Excerpts may be quoted up to 300 words, as long as credit is given to my original blogs and links provided to my original blogs. Thank you. Shortly after “The Bible” TV miniseries came out, Whoopi Goldberg on The View mentioned that psychic John Edward had endorsed the movie. Whoopi seemed baffled as to why Edward would endorse the movie. To find the answer, I Googled on the the search string [“Roma Downey” “John Edward”]. I guess it should come as no surprise – I stumbled across several articles connecting self-proclaimed “Christian” Roma Downey with psychic medium John Edward. The Bible condemns occult practices such as those of John Edward. Seems to me this is powerful proof Downey is not a Christian as she claims, but a New Ager. So far I have found two articles detailing Downey’s connections with Edward. I have reposted them verbatim below, to document these connections. I have emphasized certain points by bolding, and inserted comments in [brackets]. ACTRESS Roma Downey has talked to her mother through a psychic on live TV. The Derry-born Touched By An Angel star was a guest on a celebrity version of the US psychic show Crossing Over, hosted by medium John Edward. Roma’s mother Maureen died of a heart attack in Derry when she was 10. And Roma was heartbroken that she was never able to tell her how much she loved her. So she jumped at an offer from the producers of the show on the Sci-Fi Channel to speak to her mum using Edwards for the connection. Downey sat directly behind Edwards during the programme and he did not know who the celebrity he was speaking to was until he turned around at the end of the segment. He was able to tell that the 41-year-old actress was caught in a hail of gunfire during an IRA gun battle 30 years ago which almost killed her. Facing the audience, he said: “I hear you crying. I hear some sort of popping. The psychic show will be aired in America tomorrow night. And a reader comment on the second edition of the book (which also includes Downey’s CD) states: “John Edward came out with this brilliant concept with Roma Downey”. Roma prays the entire rosary on the beautiful CD that comes along with this book. It’s quite lovely and gives you the special opportunity and a unique spiritual closeness to Roma to be able to pray right along with her as if she was right there at your side. The book above by well-known author John Edward was published in April . 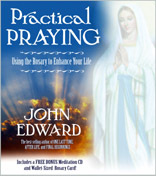 Practical Praying is divided into three sections; the first includes Edward’s thoughts about writing the book and his own personal approach to prayer, as well as the history of the rosary in the Catholic Church. The second section discusses usage of the power of prayer through the rosary. The last section is the audio CD, which the author says is “one of my favorite parts of the book. It’s unbelievably beautiful.” Roma Downey refused to accept pay for her work, instead asking Edward to make a donation to Operation Smile in her name “so she could pay for more smiles,” he said. You might enjoy purchasing one of Roma’s beautiful rosaries from her collection at QVC to use when listening to Roma’s beautiful voice or you may use them and pray the rosary with her. For those that may be surprised that John Edward wrote a book all about the use of the rosary in your life, you may feel differently after reading a recent article Praying the Rosary [link not included] John Edward’s new book details his favorite ‘weapon of spiritual defense’ that ran recently in The Catholic Telegraph. Click on the link [broken link] to The Catholic Telegraph to read the full article. Although to many, including some Catholic clergy, they are not surprised at all. During the run of his popular [psychic medium] show, he always promoted the use of the rosary and shared that he prayed it daily. John Edward is an Irish-Italian Catholic. In regards to this specific book and his promotion of the rosary, he even received recently a papal blessing, signed by the current pope when he was still Cardinal Joseph Ratzinger, head of the Congregation for the Doctrine of the Faith. [Wow – I’d like to research this further – the Pope is “God’s man on Earth.” All his decrees are (supposedly) infallible – yet he gave his blessing to Edward’s book??? Shocking.] The book has become quite popular with Catholics and non-Catholics alike. I do believe Mary accepted Christ as her Saviour – that she was born again and is in Heaven. But she is not an intercessor or Co-Redemptrix (hopefully I’m using the right Catholic terms). And any messages or apparitions supposedly from her are actually demonic counterfeits. Retta Blaney, A psychic guru prays the rosary: John Edward’s new book promotes the ancient prayer – A Catholic article that details how Edward came up with his rosary concept; barely mentions Downey.